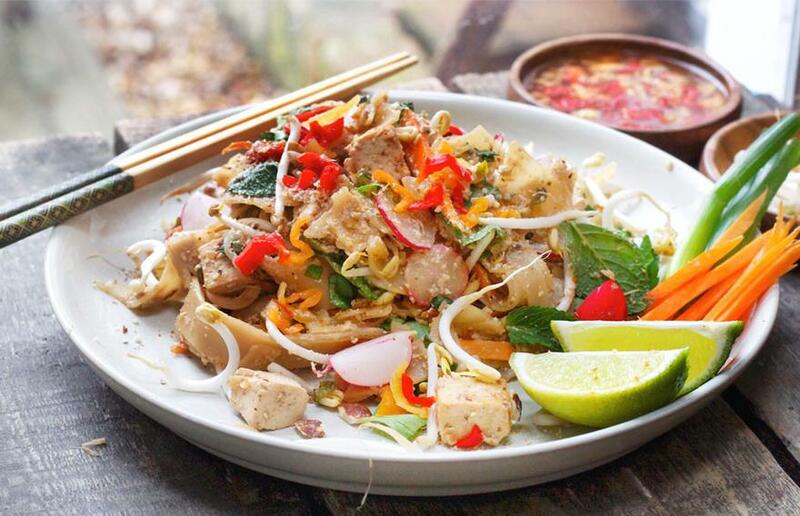 This Pad Thai recipe is absolutely delicious. Make your tamarind sauce. Add the tamarind paste, vinegar, ume, tamari and maple syrup to a small pan. Bring to a boil and then let it simmer on a low heat until everything is dissolved and mixed in well and leave aside. Then roughly chop or crush your nuts and leave aside. They do not need to be too finely chopped. De-seed and finely slice your chillies and add them with the juice of 1½ limes and ½ tsp of maple syrup to a bowl. Leave aside to pickle. Heat up your oil in a wok on a high heat and add onions with 2 pinches of sea salt. Stir on a medium heat until they turn translucent. Add garlic and 2 of the spring onions to the wok and mix in well. Add your soy chunks and one more pinch of sea salt and mix in. Then drain your silken tofu and pour the whole block into the wok. With your spatula mash it into the rest of the mix so that it mixes in like scrambled egg. Keep mixing everything for another 3-4minutes. Now add your noodles, your tamarind sauce, ¾ of the bean sprouts, ½ of the herbs and ¾ of the nut mix and mix in really well together. Once done turn off the heat and add ¾ of the radish slices. To serve: Add fresh herbs, carrot sticks, bean sprouts, lime, radish slices and nuts as garnish with pickled chillies on the side.